I’d think twice about trying to write the history of just any one of these models, considering how many other reviews have already covered them. I’m not about to try covering all three aircraft! Revell had a large series of WW1 and WW2 fighters in the 1960s. A number of them were also released as three-packs. There were a couple of WW1 threesomes, and sets from both the European and Pacific theaters of WW2. This set brings together the Spitfire, Hurricane, and Bf-109. The sets had some things in common. 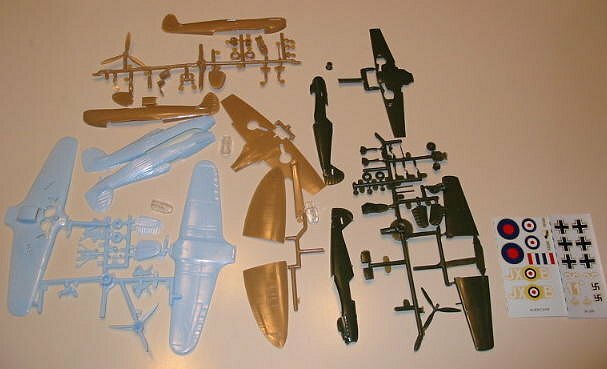 The aircraft were each molded in a different color of plastic, which is a good thing, because the parts to all three are in a common box. A single set of instructions is provided, but it is just a composite of the three individual kit instruction sheets. A single decal sheet was provided, with the decals for all three models on it. The planes in this kit are similar in age and engineering. They are all fairly simple kits, each one has about 15 to 20 parts. All three have raised panel lines and lots of raised rivet detail. All three models can be built with the gear up or down. The main cockpit detail consists of a pilot figure. The kit does not identify which mark of the aircraft is modeled. The instructions carry a 1966 date. The aircraft have what look to be typical markings for BoB aircraft, but no information about what squadron each aircraft is from. The Hurricane is molded in light blue. It has a metal wing, which means it is a later Mk I, and not one of the early aircraft with the fabric wing panels. It also has a 3-blade prop, which is consistent with the metal wing. The Hurricane has no cockpit detail at all, just a pilot with a seat molded to his back. The pilot also isn’t as sharp, detail-wise, as the pilots in the other two planes. This is an old kit—there is a 1963 copyright logo on the inside of the wing. The Spitfire is molded in tan. The pilot here gets a real seat, but no other detail. It is a model of an early Spitfire, either a Mk. I or Mk. II. The plane does have a 3-blade prop. Interestingly, this plane (only) has part of a display stand on the sprue- the arm is there, but there’s no base. The Bf-109 is molded in dark green. It too, has a 3-blade prop. The pilot and seat are separate moldings, similar to the Spitfire’s. Otherwise, there’s nothing remarkable about it. Conditionally recommended. These “3-fer” kits are probably only of interest to collectors. There are so many good kits of these planes in 1/72 these days, much better than these old kits. Still, they are a neat trip down memory lane. Review kit courtesy of my old wallet.